Have you tried our new breads? 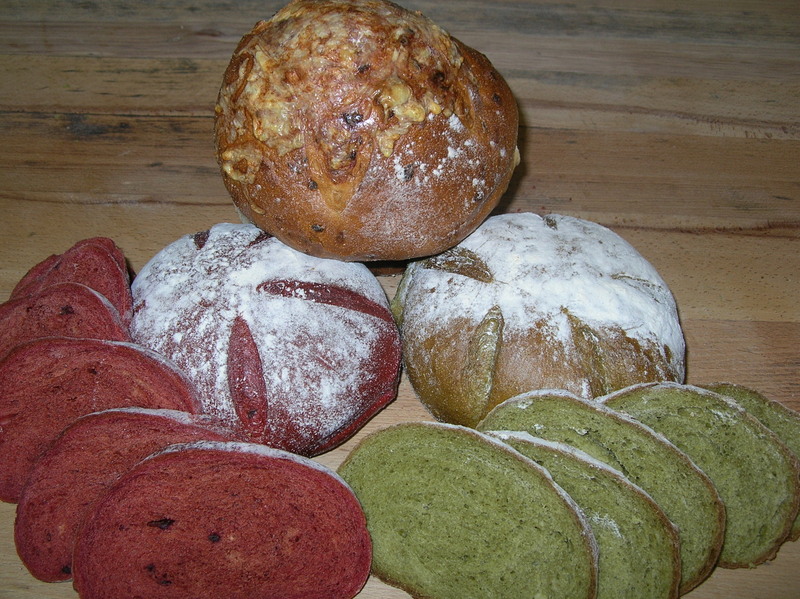 We have three new breads we have been making recently. Beetroot ~ a deep red colour and earthy beetroot flavour derived purely from the amount of beetroot we add to our dough. If you like beetroot you’ll love this. Serve a slice with horseradish and smoked salmon, delicious. Spinach and Celery ~ Never had green bread? Now’s the time to try it. A background flavour of spinach which also provides the colour, with celery to the fore. Ideal with soup or try green bread and ham! (Apologies to Dr Seuss). Cheese and Onion ~ No more fancy colours, a white bread with added onion and a good sprinkling of cheddar on top. Makes a great sandwich with cheese or cold meats. All these are made with our overnight fermented dough and our sourdough starter and stonebaked direct on the oven floor. Please note they are currently only available on Fridays and Saturdays. This entry was posted in Bread, News and tagged Bread, real bread, sourdough, sourdough starter, vegetarian, Victoria Bakery. Bookmark the permalink.